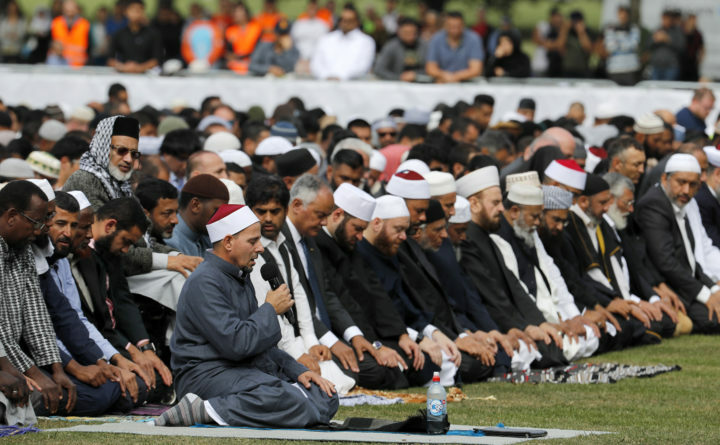 Imam Gamal Fouda, holding microphone, leads Friday prayers at Hagley Park in Christchurch, New Zealand, Friday, March 22, 2019. People across New Zealand are observing the Muslim call to prayer as the nation reflects on the moment one week ago when 50 people were slaughtered at two mosques. CHRISTCHURCH, New Zealand – It has been a week since a gunman spouting anti-immigrant hate stormed into two mosques in Christchurch, killing 50 people and transforming New Zealand. The funerals have only just started. Ardern said the ban covers all “military-style semiautomatics” – defined as semiautomatic guns capable of being used with detachable magazines that hold more than five rounds. Parts and accessories that can be used to convert less powerful guns into military-style weapons also are banned, along with all high-capacity magazines.